We've had quite a few stories concerning the state of late night television. It's been too fun to ignore. In anticipation for Conan's 60 Minutes interview this Sunday, we bring you a blast from television's past. The opening from the very first Late Night with Conan O'Brien. It actually is pretty classic television. 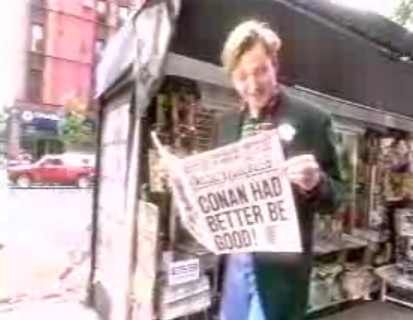 Conan leaves his (real) apartment and walks to his new gig. Friendly New Yorkers berate him with pressure to be as funny as his legendary predecessor David Letterman. With a classic, black comedy ending. Unfortunately, I can't embed it for you. So just click here to see the magic.